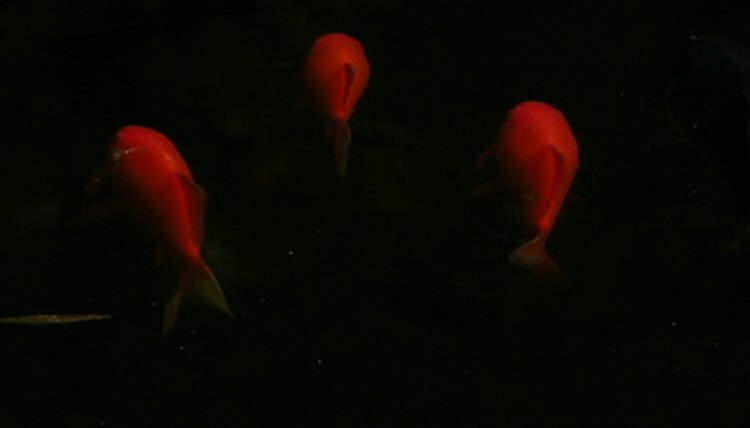 The primary threat to goldfish during wintertime is not the possibility of freezing, but instead the possibility of suffocating. Goldfish are naturally found in cold waters, and are suited to survive in such an environment. However, when goldfish consume oxygen through their gills, they produce carbon monoxide and ammonia, both of which are deadly to them. During the warmer months, plant life and filters remove these two byproducts, and aerators such as filters and waterfalls add oxygen. In winter months, the filters freeze, which stops this process. However, through a few simple steps and planning, you can help your goldfish survive the winter. Plan for the winter months well in advance. Many steps require advanced preparation, so make sure to determine when your pond will most likely freeze and when you need to complete each step. Purchase goldfish in the late spring to early summer. Feed the goldfish a high-quality pallet food up to three times a day during the summer. By purchasing your fish early and providing them a quality diet, you will help accustom them to their environment and add weight to their bodies to ensure survival during winter months. When the winter months come, switch the diet to a wheatgerm-based food as it is easier for fish to digest during a period when they are inactive. Install the venturi aerator on the submerged-water pump before the water freezes. The venturi aerator is designed to pump oxygen into the pond, ensuring your fish will not suffocate. Furthermore, it moves the water in an upward motion, keeping a portion of the pond unfrozen and allowing carbon monoxide to escape from the pond. Change one-fourth of the pond water soon before the pond freezes. Drain about a quarter of the pond and replace it with fresh water to remove a large amount of the ammonia present in the water. Add the zeolite according to the package directions to the fresh water, which will also reduce the amount of ammonia. Turn off the above-ground pumps immediately before the pond freezes to prevent them from freezing and breaking during the winter. If the entire pond freezes over, it is imperative to unfreeze a small portion of it to allow carbon monoxide to escape. To accomplish this, pour boiling water over a small portion of the pond until it unfreezes. Never break the ice in a pond, as it can have detrimental effects on the fish.